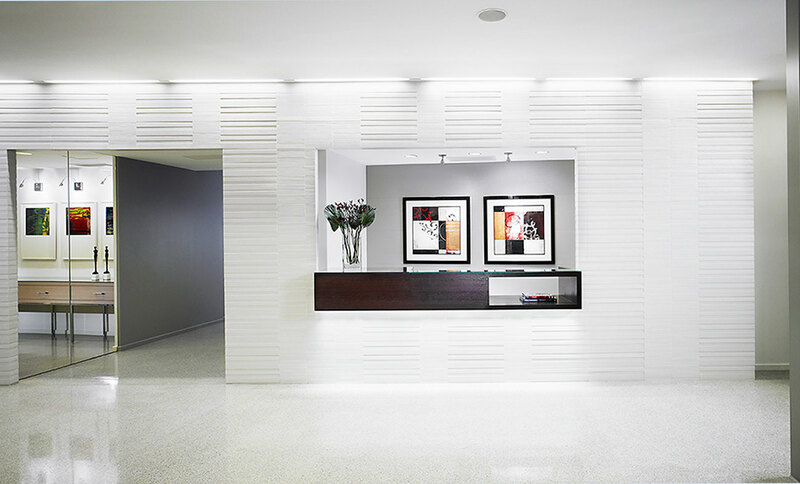 In an extensive redesign of two office buildings in the heart of Washington, D.C.’s West End, ForrestPerkins and Shalom Baranes Architects combined sustainable design with uncompromising luxury to convert aging commercial spaces into the bold WestEnd 25 apartments. The adaptive reuse of WestEnd 25 is interesting not only in the space’s new function, but in the fact that the nature of the buildings changed so dramatically in their appearance and efficiency. The team transformed the original architecture, stripping away the precast exterior of boxy, repetitive concrete panels in favor of a sleek steel and glass façade. The entire skin was removed from the building, leaving little more than slabs and columns and affording the chance to cut the inside edge of one side of the U shape at an angle. A four-floor vertical expansion raised the height of the existing buildings to ten stories, and multiple terraces, green spaces and a swimming pool were added to the rooftops. A new five-level addition joined the two buildings, giving the structure a horseshoe shape and providing space for a lushly landscaped courtyard with an entrance colonnade and fountain. The designers paid particular attention to the entry experience, creating a dynamic geometry from the structure’s newly angled front and central courtyard, on through the public space’s glass curtain walls and rear courtyard beyond. The front courtyard acts as a transition space between the street and lobby, employing a slender water feature to draw the eye into and through the lobby. The extensive use of transparent glass in the interior as well as the facade brings a new grace to the building, balancing its precise composition and allowing natural light to penetrate deep into the structure. Visible from the common areas, the bamboo-lined rear garden serves as a terminus for the view through the building. 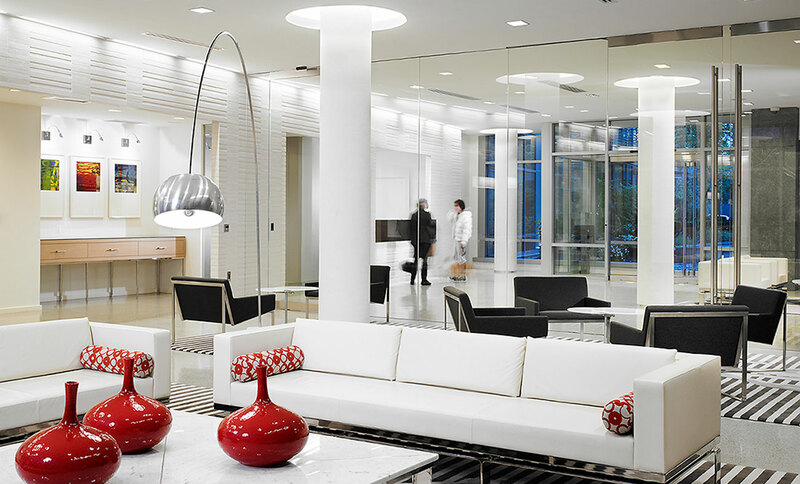 The project’s refined interior palette makes extensive use of light colors, with a strong accent of “WestEnd 25 Red” located strategically throughout. As with all “minimal” designs, the detailing became the focus, in order to provide fluid and subtle transitions and connections between materials. 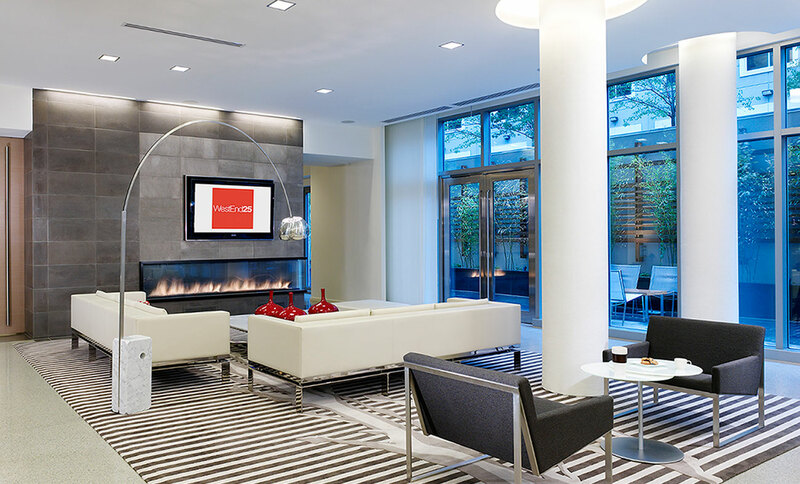 Furnishings and amenities were selected to express a modern aesthetic without adhering to any temporary trends, and to capture the “classic modern” ideal without sacrificing the warmth and comfort expected in a residential community. The common areas for the property include a resident lounge and entertainment kitchen, business center, meeting room and fitness center, and the landscaped rooftop includes a lounge with kitchen and a pool deck. The 283 apartment units offer light-filled, open floor plans which incorporate floor-to-ceiling windows that have breathtaking views of Georgetown and Dupont Circle. 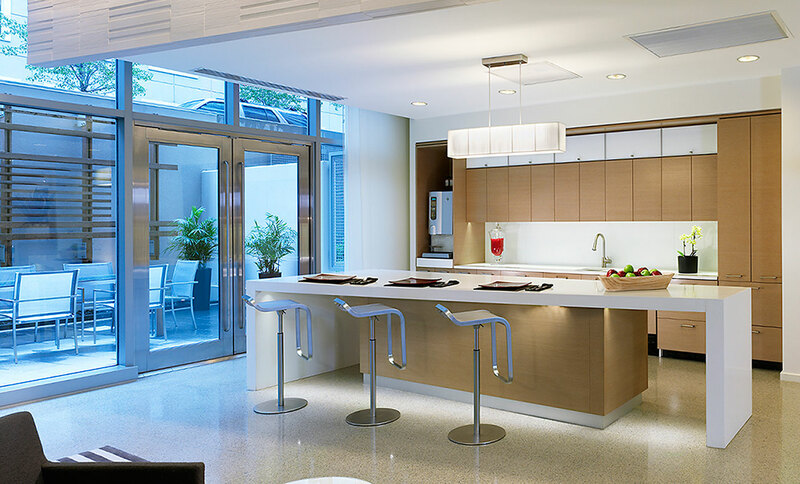 WestEnd25 meets the U.S. Green Building Council’s LEED Gold certification standards, which is a rare distinction among apartment communities in the D.C. area. The dramatic change in the efficiency of the building was achieved by the project team’s concerted effort not only to select environmentally responsible materials, but to incorporate them with systems and initiatives that are on the leading edge of green design. The project’s seamless blend of luxury and sustainability emphasizes the team’s philosophy that “green” design neither enhances nor sacrifices any aspect of the luxury experience. WestEnd 25 is simply an achievement of intelligent design, and a benchmark for Washington, D.C.’s West End community.